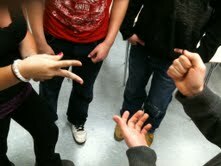 The History 2.0 Classroom: No Technology...good old Rock, Paper, Scissors....Shoot! No Technology...good old Rock, Paper, Scissors....Shoot! We are currently examining the Industrial Revolution. As part of the unit we examine the teachings of Karl Marx, learn about the stages of history, exploitation and a world wide worker revolution. 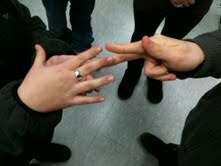 Before we get into any Karl Marx, my students play the Rock, Paper, Scissors - Industrial Revolution simulation. The game is simple. Everyone starts with two paper clips, people challenge each other (rock, paper, scissors) to win paper clips. If you lose all of your paper clips, you become a worker for the person that you lost to. You can gain your independence if you earn two victories for your boss. However, once your independence is achieved, you are right back in society with one paper clip and only one loss away from becoming a worker again. The purpose of the simulation is to get students to understand Marx's theory of exploitation of the working class. Usually towards the end of the simulation, I will announce that I don't appreciate the level of exploitation that is taking place that I then redistribute the wealth evenly amongst the class. Is the classroom loud, absolutely. Is there energy in the room, to much to describe. Are they engaging in a physical activity that will allow them to remember and connect an academic idea, that is the goal. What I like the most about this activity is displayed in the Round 1.2 image above. I never discussed corporation, mergers and joining forces...and look what happens. The three 'Owners' that exist later in the game are all corporations that have joined forces to increase their capital and workforce. It is revealing and interesting to listen to their negotiations about who owns the corporation, who has power and who are the workers. The simulation can be played in 15 minutes, or you can let it play out for an entire period. I follow up this activity by having students examine excerpts from Karl Marx's writings. They theory that they are exposed to in the readings is easily connected to the experience they went through while playing the game. Love it, Greg...thanks for sharing! I will definitely be stealing this idea next year and I'll you know how it goes. Simulations like this are excellent because later in the year (like when you are learning about the Russian Revolution) all you have to do to remind them of the concept is say "remember the paper clip game?" Any time you can review a whole concept with a sentence is serendipity! Great explanation, Greg. I saved it in my history Diigo folder. There are so many good resources from fellow teachers willing to share. Thanks! I like your previous post of putting together a proposal with your PLN all over the country! Bravo! Awesome! I am doing this tomorrow. Great idea! Love it! Will be doing this when I do the industrial revolution in about a month. What a neat idea! I've divided students into workers and capitalists before, but never considered having the kids play a game to determine their role in society. I've used this many times. It works great and the kids have a blast. It was awesome working in the same building as @gregkulowiec! I'm demoing this lesson for my whole department tomorrow! Still one of my favorites. Since the images are pixelated, can you provide a more in-depth description of the mergers and corporations? Also, which readings of Marx do you share after the activity? Thanks. Great idea. Benjamin...this is quite a delayed response. The mergers and corporations simply happened. Students devised the plans. It seems that the parenthetical numbers indicate the number of paper clip each owner possesses, while the "workers" list refers, of course, to the number of employees that same owner employs. Hi Greg, Thank you for sharing. Can I get access to the full directions for the lesson and game in the link above? There is a link in the post to a doc that you can download with the directions. Good luck, it is a great simulation! The link says that I need permission through Google Drive. I just modified the link to a public google doc...should be all set. Have you ever had to prompt students to organize into "corporations"? I tried this game with a college class and perhaps I didn't give them long enough, but the corporations didn't naturally form. Thanks for any suggestions you might provide. Sometimes I would mention the idea, other times it would happen naturally. We typically player two rounds in 30 minutes.